This article pertains to the European Parliament’s recent approval of a law obliging Italy to remove the Crucifix from the walls of its public schools. The measure is causing a great deal of justified indignation. Europe is being governed by institutions that are openly against God. They exalt anti-Catholic symbols while forbidding the Cross as much as possible. The Cross is not only a religious symbol, but also a cultural one, since it was under its shadow that Christian Civilization was founded. The Cross of Christ is what identifies Europeans as brothers, and must be respected by anyone who wants to live among us. Above is the famous picture called The Babel Tower by Pieter Bruegel (1525-1569). He was born in Breda, Holland and was one of the leading Flemish painters of the 16th century. At right, he depicts himself in a portrait made in 1565. 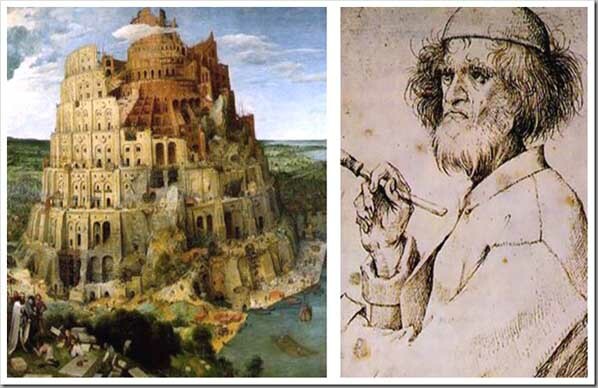 Of the 45 pictures we have of his work, the Tower of Babel is one of the best known. Now then, the structure we see above is the European Parliament building in Strasburg, France. To its right is one of the first postcards of the institution [taken from its official website; today no longer available there]. 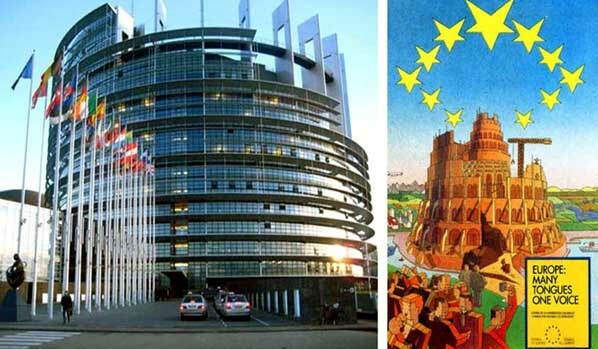 Comparing the photos, one sees that the European Parliament building seems to have closely followed the design of The Babel Tower by Bruegel. Perhaps for this reason, the Strasburg edifice is also known as the “Unfinished Tower,” signifying that the European unification is still in the making. The symbolism is further stressed by the motto we find on the postcard: “Many tongues, one voice.” In the biblical account, God confused the languages and scattered the peoples over the earth to punish them for their pride. 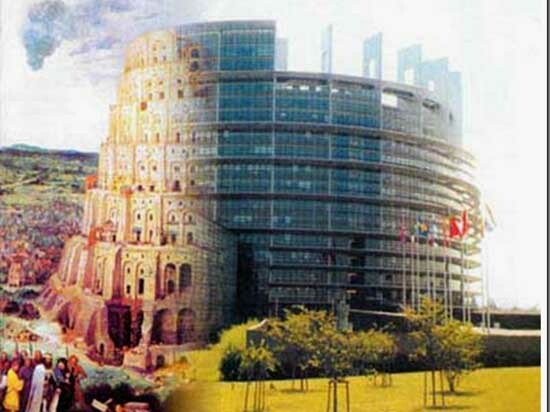 When we consider the building and the motto of the European Parliament, it seems that we are witnessing an attempt to restore that old Babel Tower. Like its predecessor, the modern Babel Tower – by the affirmation of its own identity independent from God – symbolizes a rebellion and challenge to God and His norms. Supposedly our laws are democratically and freely made by legal institutions. In reality, however, it seems that they are inspired and controlled by behind-the-scenes organizations with an international influence and by secret societies that are occult and follow Lucifer’s instructions. Were Rampolla and Gasparri Masons? Did Masonry Stop Attacking the Church?